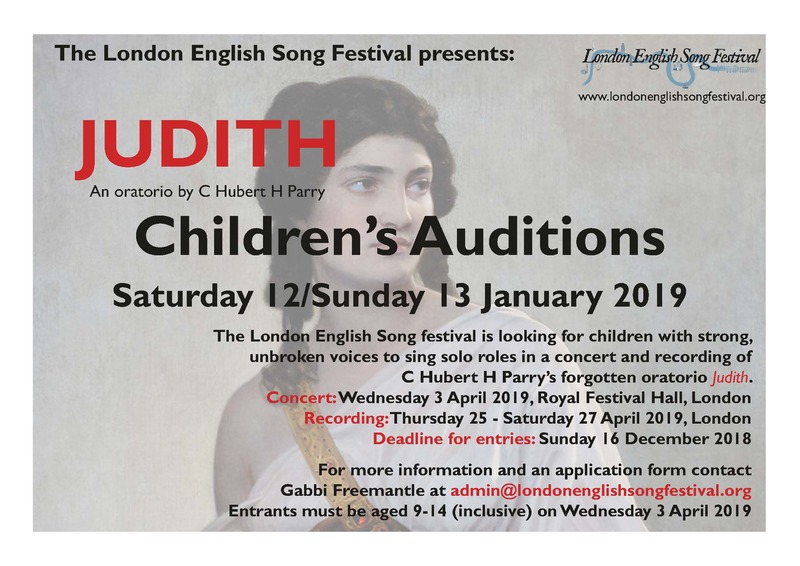 For our 2019 project, Judith, we are looking for children with strong, unbroken voices to sing solo roles in both the concert performance and recording of C Hubert H Parry’s oratorio. For more information and an application form contact Gabbi Freemantle at admin@londonenglishsongfestival.org or via the contact form. Entrants must be aged 9-14 (inclusive) on Wednesday 3 April 2019. Education is at the heart of the work of the LESF. We constantly strive to widen the knowledge of English song among the current generation and to preserve and enlarge it for future generations. We are also committed to broadening the standard English song repertoire, which for many singers often consists of a handful of pieces. It is common to find gems among many lesser-performed areas of the repertory, and uncovering those is a constant joy for all of us. Our concerts, always reasonably priced and with special rates for students and children, explore the world of English song and its performance. Some of the world’s foremost exponents of their art have performed at the LESF, including Ann Murray DBE, Roderick Williams, Iain Burnside and many more. Our many pre-concert talks have been given by such leading figures as Professor Jeremy Dibble and Judith Weir CBE, Master of the Queen’s Music. 2016’s Songs of the Somme saw our first full educational project in collaboration with Wilton’s Music Hall and their educational department. A tailor-made, interactive performance of Songs of the Somme was given to local schoolchildren, preceded by a talk about the historical context of the songs and poetry and followed by a Q&A session with the performers. This opportunity to converse with the musicians was one of our educational highlights so far! Get in touch via the contact form if you would like to assist our project financially.